Dust Tec Dust Control Tablets are a Polymer tablet designed for use in soil erosion and dust control. These tabs will flocculate unstable fine soil particles and viscosify water. Dust Tec is made of a linear polymer, linked with an effervescent system. The tablet will immediately dissolve in presence of water, releasing the polymer without any mechanical stirring, without any gel blocking. The immediate dissolution of the tablet allows the homogenous dilution of polymer in the water tank. 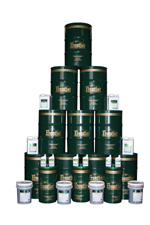 Dust Tec is specifically developed to avoid the use of any specific dosing equipment. Dust Tec mix rates will vary depending upon soil type, soil matrix, field slope, and water volume. Rate adjustments can be made during use based on observed results. One tablet per m3 (250 gallons) make a 5 ppm concentration (AC). In general one tablet per two hundred and fifty gallons of water (1:250) is a good starting point. In most conditions one tablet to five hundred gallons of water (1:500) provides optimal performance. * When stored inside a building at a stable temperature between 5° and 30°C, without any contact with atmosphere. Values shown are typical, and due to manufacturing tolerances may vary.